In 1995 Congress defunded the Office of Technology Assessment, a nonpartisan scientific and technology research arm of Congress. Today, two congressmen are trying to bring it back. Rep. Rush Holt (D-NJ) and Rep. Michael Castle (R-DE) need your help to reinstate this important institution in Congress. The OTA would provide nonpartisan research on technology issues ranging from energy independence to net neutrality. 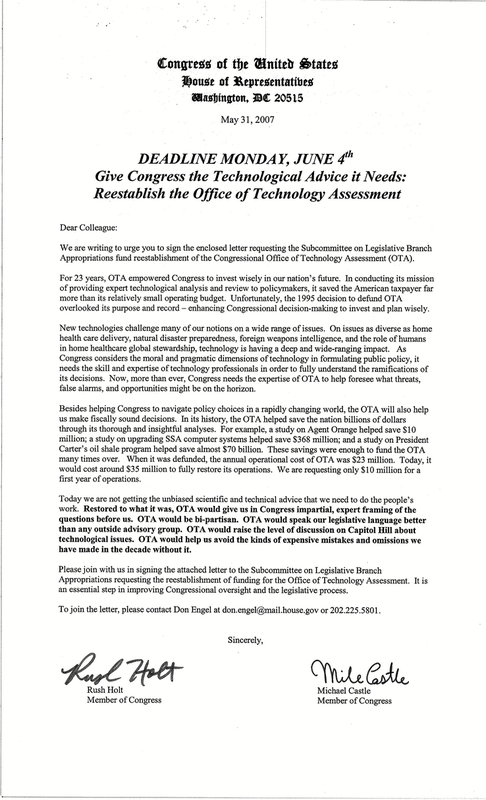 Here at Sunlight we are especially excited about the reinstatement of OTA as it would provide members of Congress with assessment of the technology infrastructure within Congress itself. The OTA would also put all of its research online for everyone to access. On Monday, the Legislative Branch Appropriations Subcommittee will hold a markup that will address the OTA. We need you to call your member of Congress and tell them to 1) support the reinstatement of the OTA and 2) to sign the Dear Colleague letter that they received from Reps. Rush Holt and Michael Castle and return it to Reps. Debbie Wasserman-Schultz and Zach Wamp. When Congress defunded the OTA one of its supporters, Rep. Amo Houghton (R-NY), said, "Members of Congress are deluged with advice from many quarters, but it is often tinged with the underlying bias and political agenda of the bearer. … We are cutting off one of the most important arms of Congress when we cut off unbiased knowledge about science and technology." It's time to bring back the OTA and unbiased research on science and technology. Call your congressman now!